Complete reconstruction of one of Sao Paulo’s best located stadiums was launched in 2010, in line with 2014 World Cup preparations. But the project had little to do with the mega event – it was a private venture of Palmeiras, WTorre (contractor) and AEG (world’s leading entertainment operator). AEG gained access to Sao Paulo’s lucrative event market with this venue. From early stage it was planned to leave the northern curve of old stadium’s bowl and incorporate it into the new layout. This way one end was to be nearly rectangular, while the other – oval. First concept was drawn by Tomas Taveira, while the final design came from Edo Rocha’s team. According to the vision, external cladding consists of perforated metallic mesh weaved through support structures. The building is dominated by 5 towers, which form primary access routes for fans and provide support for the roof at the same time. The stands have two regular tiers with a double balcony with skyboxes. The northern curved stand may become an amphitheatre of its own for smaller events, while also providing room for stage for larger concerts without damaging the football field. While construction began in 2010, delivery of the stadium failed time and again, resulting in a nearly 1.5-year delay compared to early schedule. It also influenced the budget, which rose from R#330 million to some 630 million. The old name was scrapped for commercial reasons, a move expected and well justified with the cost overruns. But, as a compromise reached by fans in public vote, long-term sponsor Allianz added ‘Parque’ to its brand, referring to the old stadium’s nickname Parque Antarctica. First stadium in this part of Cariacica was opened in 1983 by Rio Branco AC, the club who bought their new plot in 1970s. With stands curved in the sloped land it was a very cheap structure, but also proved to age rapidly. Especially that stands able to hold over 30,000 fans saw their heyday in 1980s (reports of up to 50,000 people can be found) and later stopped filling to capacity. This is why the dilapidating stadium was transferred to the Spirito Santo state authorities in 2008. Complete reconstruction began in March 2010 and was due for delivery in Spring 2014. Eventually the deadline wasn’t met, but the building was able to play its role as training centre for the Cameroonian national team during 2014 World Cup. Structurally the stadium inherited its stands from the old one. Though all prefabs were laid anew and better access routes were created, the basis and slope remain unchanged. One significant difference is the lack of any seating in the south and north – size was decreased and the stadium left more open. The audience is topped by large steel ring of the roof, a symbolic crown set atop tall concrete towers. Entire project consumed R$180 million, much above the initial 100 million figure. 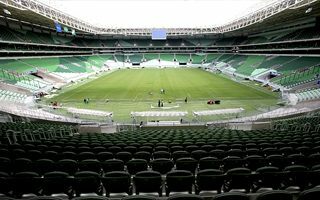 Rio Branco remain the key tenant in football terms, but the stadium’s athletic value is expected to grow, especially as it was selected as training facility for the 2016 Olympics. Soon after reopening in 2014 the first concert took place and saw Paul McCartney perform.